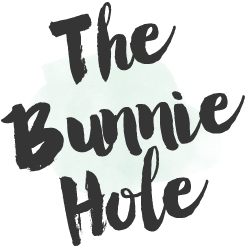 TheBunnieHole | Vancouver Youtuber & Blogger: Review: NIVEA | Lip butter "Vanilla & Macadamia"
Review: NIVEA | Lip butter "Vanilla & Macadamia"
It seems like the beauty world is still riding out the lip butter wave and who could blame them, even the term itself sounds luscious and delectable. I was so excited to hear that a new lip balm has finally hit the drugstore shelves because this is one department that hasn't seen any new products in quite a while. Product: Lip Butter in "Vanilla & Macadamia"
Would I repurchase: Yes, most likely. 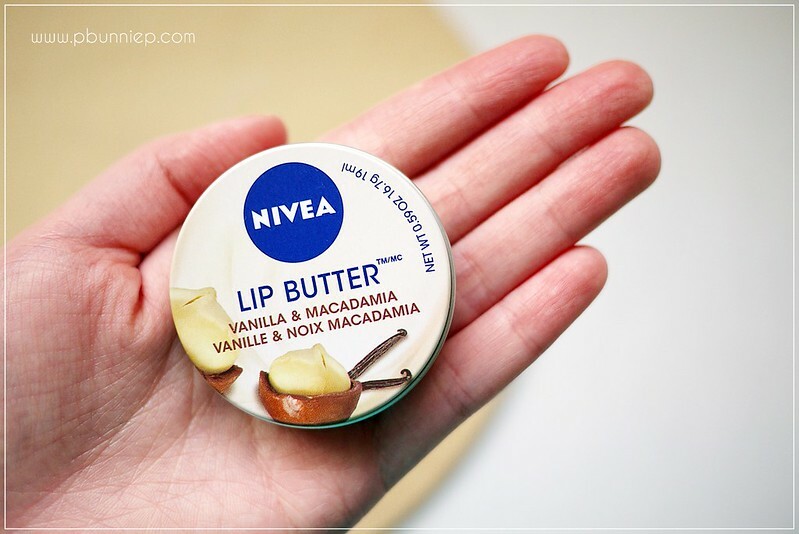 I have a bit of an unsettled relationship with Nivea lip products, they are well known for their skincare and lip care especially yet I've never been fully thrilled with the latter. Having tried a few of the classic blue tubes (even a tinted one) I've always felt that the texture didn't feel comfortable on my lips, a little too waxy for my taste but the idea of a lip butter had my attention and I quickly dropped it into my basket. 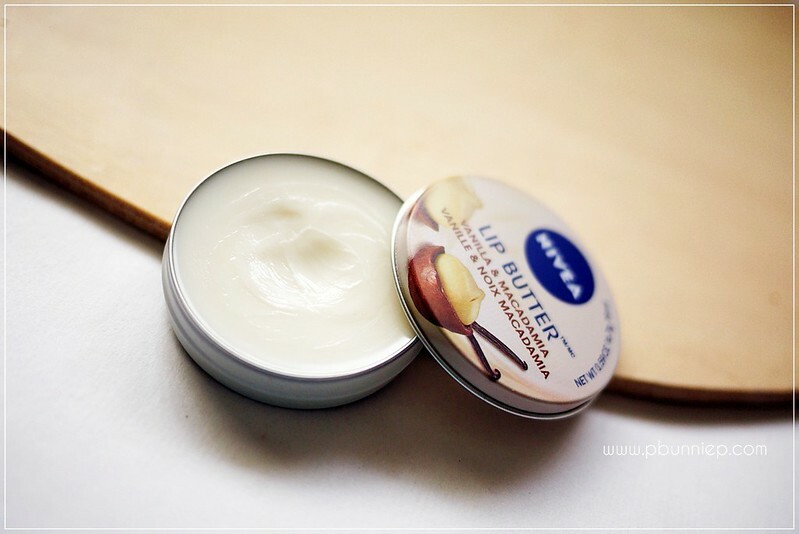 "The moisturizing formula of NIVEA® Lip ButterTM with Hydra IQ contains shea butter and almond oil and provides intensive moisture and long-lasting care. This pleasant formula with vanilla and macadamia aroma leaves lips sensationally soft." 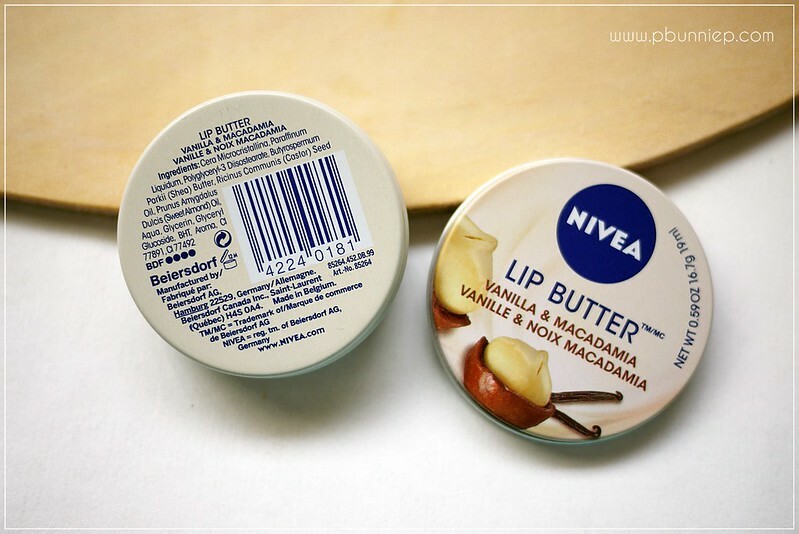 One thing that NIVEA got right this time around was the brilliant melting texture of this product. The revival of the classic tin may not be loved by everyone but it works perfectly with the consistency of the lip butter. Although it is wax based, the butter smoothed onto my lips comfortably, softens the look of lip lines and gave me a soft moist sheen without any oily residue. I believe all the shades turn out colourless though a few, like Raspberry Kisses, has a tint in the jar. Moisturization factor is perhaps a bit above average but nothing extraordinary, it will keep dry lips comfortable and protected during the day but it doesn't seem like its going to have any long term repairing properties. I have been using this constantly when I'm at home because it just feels good to put it on and especially as part of my before bed routine (Carmex and I are on a break). I would have liked to see mineral oil (list as paraffinum liquidum at the top of the ingredients list) be replaced with something more natural but at such a low price perhaps it's more a choice of economics rather than skin friendliness. It is something that reappears in many iconic NIVEA products so it's not really a surprise though I was hoping for a change. Nonetheless, I think this is a basic likeable product that I'm looking forward to using for the next few months. I also really enjoy the fact that this balm is absolutely kissable, no strange taste or gooey residue left behind which gets a smilie from the boyfriend. My Vanilla and Macadamia version has a deliciously rich scent that makes me smile every time I pop open the lid. Try this if you're looking for something for a little shine and softness but skip it if you were hoping it's going to heal dry lips. Have you had a chance to try these yet? 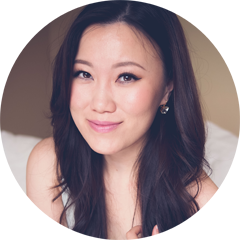 How do they compare to your other drugstore favourites? These smell delicious but unfortunately do very little for my lips. I have to continuously re-apply and since petrolatum is the top ingredient, I feel like I am just swallowing a bunch of vaseline. Oh god i saw this product on YT and have been praying that it'd be offered in my country too! it looks so delectable! I actually like the tin packaging and the flavours sound delicious - excited to try these when they land in Australia (not sure if they have already as I haven't seen them around yet). Didn't konw mineral oil was the top ingredient though! I haven't tried this yet but it sounds gorgeous think I'll get it! I have tried the original one, but its sticky =( don't really like it.